The United States Navy normally had one aircraft carrier assigned to Central Command's fifth fleet. The single carrier supporting operations in the Persian Gulf and Arabian Sea is normally deployed for about six months, with this duty alternating between carriers based on the East and West coasts. As of mid-January 2012 the US Navy had two carriers in the region - CVN-74 Stennis which arrived in early September 2011 [and thus might remain on station until March], and CVN-70 Vinson, which arrived 09 January 2012. In addition, CVN-72 Lincoln had departed Thailand on 10 January 2012, with the possibility of arriving in the Persian Gulf region a few days thereafter [though it was not clear whether Lincoln was combat ready]. The US Navy's presence in the Gulf has grown steadily since 1879, when Commodore Robert W. Shufeldt sailed USS Ticonderoga through the Strait of Hormuz, making it the first American man-of-war to visit the Gulf. Because the free flow of trade in the region was threatened as Iran and Iraq staged a "tanker war," a stronger US stance became necessary. 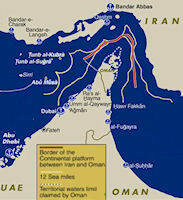 In 1987, after the Iran-Iraq War resulted in several military incidents in the Persian Gulf, the United States increased U.S. Navy forces operating in the Persian Gulf and adopted a policy of reflagging and escorting Kuwaiti oil tankers through the Gulf. President Reagan reported that U.S. ships had been fired upon or struck mines or taken other military action on September 23, October 10, and October 20, 1987 and April 19, July 4, and July 14, 1988. During the Iran-Iraq War, one of China's most controversial arms transfers involved the HY-2 antiship missile, commonly [and improperly] referred to in the media as the "Silkworm." The first of several HY-2 shipments was delivered in the summer of 1986, and in October 1987 an American-owned tanker under the Liberian flag and a Kuwaiti tanker under the US flag, the Sea Isle City, were hit by Iranian HY-2 missiles. The United States gradually reduced its forces after a cease-fire between Iran and Iraq on August 20, 1988. Operation Earnest Will proved successful. The United States reacted to Iran's military buildup in the 1990s by an increased military presence, economic sanctions, and continued political rallying against the Islamic Republic. Simultaneously, the Gulf Cooperation Council reacted by implementing efforts to improve military strength through the acquisition of weapons from the United States and others. A "spiraling effect" arms race is taking place between Iran and the GCC, in which each side attempts to gain military advantage over the other. The growth of the Iranian forces, specifically the navy and those components next to the SOH, have resulted in mixed threat interpretations. The challenge for decision-makers and strategic planners alike lies in accurately assessing the ability of Iranian forces to attempt to and, if possible, keep the Strait of Hormuz closed. On many occasions since 1989 U.S. warships exercised the right of innocent passage through the Iranian territorial sea without notice to or reaction from Iran. Multinational forces gather to participate in the world's largest mine countermeasures exercise, "Arabian Gauntlet." Arabian Gauntlet is a joint multinational military exercise to maintain the vital sea lines in and out of the Persian Gulf. Arabian Gauntlet is a multilateral exercise that integrates mine warfare with surface warfare. The purpose of the exercise is to refine coalition warfare capabilities, specifically in the area of mine warfare, surface warfare and off-shore infrastructure protection. It also promotes military to military relationships and improves the tactical proficiency of the coalition as well as enhances regional security in the 5th Fleet area of responsibility. Fleet Battle Experiment Foxtrot (FBE-F) FBE Foxtrot [30 Nov - 8 Dec 1999] was shifted from C6F to C5F due to operations in Kosovo and occured 30 November-8 December 1999. Focus areas included Weapons of Mass Destruction and Coastal Domanance. Networked combined force required 62% less time to restore mine free shipping in Strait of Hormuz (FBE Foxtrot, December 1999). FBE-Foxtrot investigated coordinated joint naval and land fires (including those provided by SOF and U.S. Army Apache helicopters) through an experimental Joint Fires Element. It explored time-critical targeting of a coordinated, multi-layered enemy at a naval chokepoint. The experiment also explored using distributed, collaborative planning to enhance understanding of the undersea environment and operational situation in countermine warfare. A battle management cell for defense against chemical and biological weapons was established to seek improvements in chemical/biological defense readiness and vulnerability assessment, warning and reporting of chem/bio events, and coordination of intra-theater support and initial responses to chemical/biological attacks. USS PAUL F. FOSTER (DD 964) departed for its eleventh deployment on January 27, 1999. While serving as part of the Pacific Middle East Force, PAUL F. FOSTER participated in OPERATION IRON SIREN, EAGER SENTRY, and ARABIAN GAUNTLET. In addition, the ship conducted boarding's in support of United Nations Sanctions against Iraq. The Shipboard Deployable Surface Target (SDST) -- also known as "Roboski" -- provides an enhanced gunfire training capability against highly maneuverable, high speed surface targets. As such, Roboski offers an inexpensive, expendable target for Anti-Terrorism/Force Protection small arms training and supports 76mm, 5-inch/54caliber, and Phalanx CIWS training. SDST's are presently maintained by the Fleet Composite Squadron Six (VC-6), COMFIFTHFLT, COMSEVENTHFLT, and the Southern California Offshore Range Extension (SCORE) in support of COMTHIRDFLT. SDST was used for gunfire training in the Arabian Gauntlet exercise. During 2000 in Neon Falcon and Arabian Gauntlet, LAKE CHAMPLAIN improved interoperability and fostered good will with forces from Europe as well as Arabian Gulf coalition partners. USS Elliot (DD 967) was one of eight U.S. naval ships participating in Exercise Arabian Gauntlet 2000. The Harry S Truman Battle Group participated in numerous international exercises during 2001, including Arabian Gauntlet, an 11-nation exercise that involved more than 20 ships. Fleet ocean-going tug USNS Catawba conducted a simulated distressed diver drill during the multi-nation operation Arabian Gauntlet 2001. Patrol Squadron 47's "Golden Swordsman" took part in the Arabian Gauntlet exercise in the Persian Gulf. VP-47 combat aircrews flew missions in support of the Arabian Gauntlet exercise, while operating out of Masirah, Oman and the Kingdom of Bahrain. The P-3 Orions of VP-47 participated with ships and aircraft from the British, German, French, Saudi Arabian, Omani, Kuwaiti, United Arab Emirates, Qatar, Pakistan and U.S. military forces. The exercise lasted 21 days, with VP-47's P-3s flying both day and night missions for a majority of the exercise's duration.The event ended on April 1 and VP-47 buckled back down to finish out the last two months of a six month deployment, with a Bravo Zulu from the commodore, DESRON 50, under their belt. For the first time in its country's history, the Iraqi Navy joined with coalition forces to participate as observers during exercise Arabian Gauntlet 2005 in the Persian Gulf 22-30 March 2005. More than 3,000 people and 19 ships from the United States, Iraq, Pakistan and other coalition and regional allies participated in Arabian Gauntlet 2005. Sixteen ships from 14 coalition and regional allies concluded Exercise Arabian Gauntlet 2007, the world's largest mine countermeasures exercise, 30 April 2007 in the Arabian Gulf. The biennial Arabian Gauntlet is a two-phase evolution. Two days of training seminars precede an eight-day underway phase. USS Shreveport (LPD 12) served as the flagship for commander, Mine Countermeasures Squadron (MCMRON) 3 during Exercise Arabian Gauntlet 2007. Throughout the exercise, Shreveport and MCMRON 3 hosted a multinational command element aboard. The exercise consisted of dive operations, mine hunting and sweeping, and the establishment of safe lanes of navigation. It culminated in a simulated merchant vessel's transit through an area that had been swept by coalition ships and aircraft. Shreveport launched its Landing Craft Unit (LCU) early every morning to provide a forward dive platform to conduct underwater countermeasure operations. The mine countermeasure ships not directly involved in diving operations focused their efforts on mine detection, mine sweeping, the establishment of routes for safe passage and a number of simulated oil infrastructure defense and force protection exercises. On 06 January 2008 three US Navy vessels took evasive actions after five Iranian boats buzzed the ships transiting the Strait of Hormuz into the Persian Gulf. Pentagon spokesman Bryan Whitman called the Iranian provocation "a serious incident." 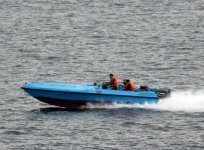 The fast Iranian boats approached at "distances and speed that showed reckless, dangerous and potentially hostile intent," he said. The incident lasted about 15 to 20 minutes. The Navy ships were going into the Persian Gulf when the Iranian boats confronted them. "Small, Iranian fast boats made some aggressive maneuvers against our vessels and indicated some hostile intent," Whitman said. "This required our vessels to issue warnings and conduct some evasive maneuvers. The U.S. Navy vessels were prepared to take appropriate actions, but there was no engagement of the vessels." The ships were the USS Port Royal (CG 73), USS Hopper (DDG 70) and USS Ingraham (FFG 61). U.S. warships will take all the precautions needed to safely transit the open waters of the straits, the Pentagon spokesman said. 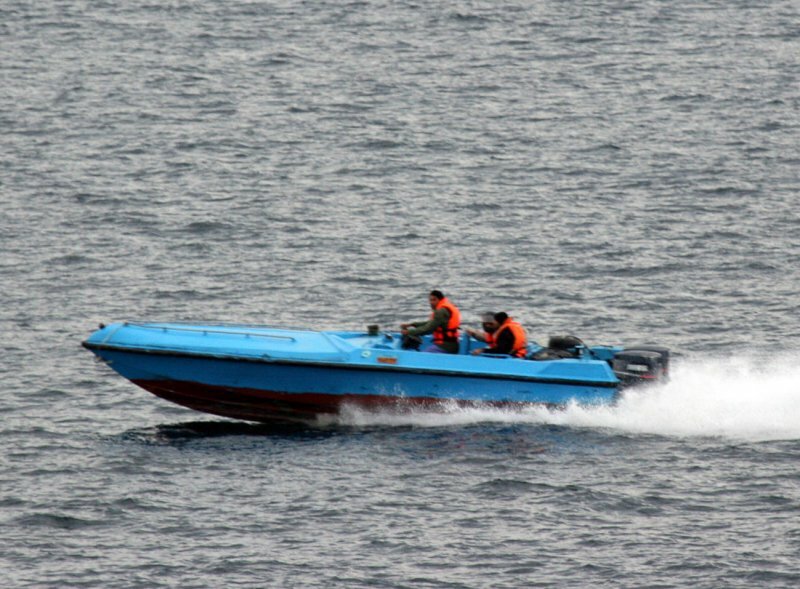 Iranian officials called the buzzing by five Revolutionary Guard speedboats of three U.S. Navy ships "normal," but American officials insisted the behavior was reckless and needlessly provocative. Iranian senior Revolutionary Guards commander Ali Reza Tangsiri told the Mehr news agency that Iran has the right to ask any ships to identify themselves upon entering or leaving the Persian Gulf. "It is a basic responsibility of patrolling units of the Revolutionary Guards to take necessary interception measures toward any vessels entering into the waters of the Persian Gulf," Tangsiri said. The San Diego element of the Tarawa Expeditionary Strike Group (ESG) departed 05 November 2007 for a six-month deployment to the U.S. 5th and 7th Fleet areas of operations. Units from San Diego include Amphibious Squadron 1, USS Tarawa (LHA 1), USS Cleveland (LPD 7), USS Germantown (LSD 42), 11th Marine Expeditionary Unit and elements of Naval Beach Group 1. USS Port Royal (CG 73), USS Hopper (DDG 70) and USS Ingraham (FFG 61) joined the Tarawa ESG in Pearl Harbor, Hawaii.